Thermaltake, being the industry pioneer brand with expertise in PC power and thermal solutions, carrying the corporate vision of "building Thermaltake Technology into a cultural brand for the enjoyment of entertainment, e-Sports, technology, and lifestyle" and continues to drive toward the corporate mission of "delivering the perfect user experience" in all segment of the market, unveil the notebook/laptop power companion - the Toughpower 90 W and 120 W universal AC power adapters addressing at user's concern. When it comes to any sort of laptop/notebook computers, the power adapters are the most often used accessory beside the main device, especially for people on the move the power adapters wears off easily. With this statement we would think a power adapter could be as important as people may think, oddly enough, people seldom pay any attention to the importance and the safety of the adapters. The Toughpower 90 W and 120 W universal AC power adapters offer the best quality and safety for the users and gamers! Universal AC 19V output & 100Vac ~ 240Vac input. 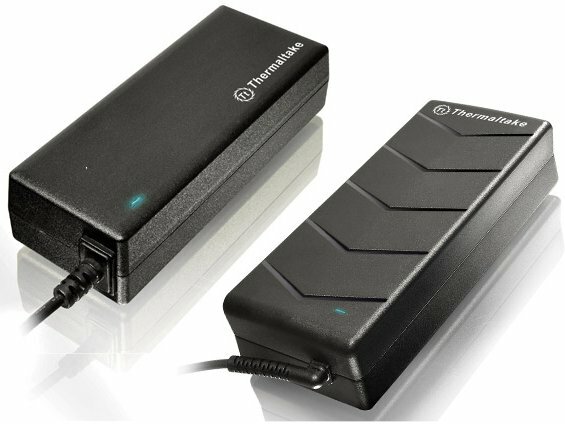 Thermaltake Toughpower universal AC power adapter has two options to choose from, the 90 W which can provides up to 100 watts of power for average users, and the 120 W which can provides up to 152 watts of power for gamers. Both of the Toughpower power adapters are built with high power-conversion efficiency circuitry, built-in over power, over voltage, over temperature and short-circuit protection, and the approval of ENERGY STAR and other international safety/ EMI organizations like UL, TUV, CE, GOST, FCC, and more. The Toughpower 90 W & 120 W universal AC power adapter pledges to be users' best companion by being durable and protective.